Stillman Development has struck a deal to transform a long-shuttered Times Square theater into a state-of-the-art store. 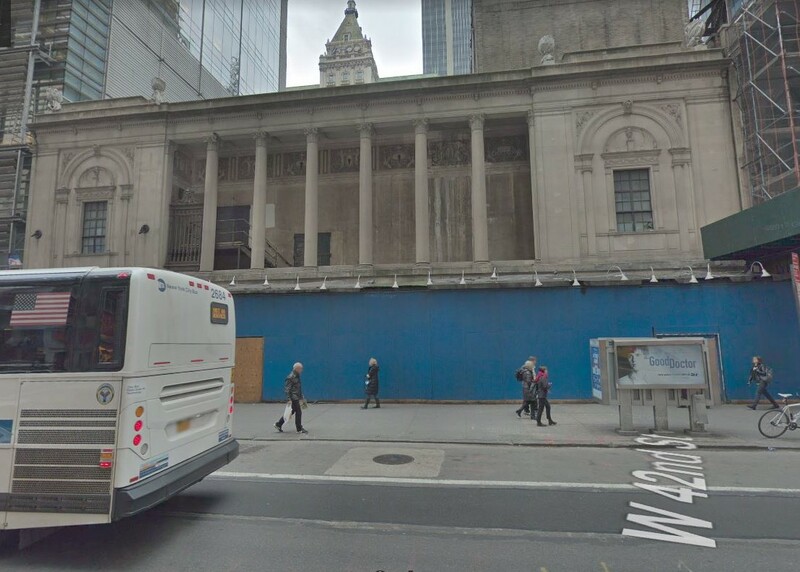 After years of false starts that promised various new enterprises, Stillman will turn the building at 217 West 42nd Street into a “21st century experiential retail” space. Beyer Blinder Belle is the architect for the project and Colliers is exclusively handling the leasing for the 43,165 s/f property. “We have an enormous responsibility to reinvent an architectural masterpiece and return it to its splendor,” said Roy Stillman, president of S.D.I. The former theater is overseen by the state’s Historic Preservation Committee and the non-profit New 42nd Street which holds a 99-year lease on the theater. Stillman will sublease the nearly century-old architectural masterpiece with the aim of making it commercially viable for the next 100 years. New York State and City established The New 42nd Street in 1990 to help give the blighted 42nd Street theaters a new lease on life. Since then, it has helped re-purpose and re-invent the Victory, Lyric, Apollo, Liberty, Empire and Selwyn theaters. Slated for retail use from the outset of 42DP, the Times Square Theater’s footprint and layout don’t meet the production needs of 21st century theatrical use and the non-profit has been searching for the right tenant for years. 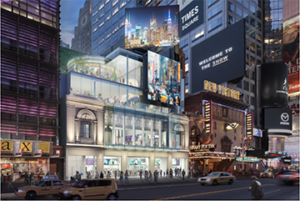 In a press release, the group said SDI’s plans “honor and respect the theater’s original architecture while incorporating modern elements to achieve commercial viability ideally suited for an experiential retail location. “Since this category of retail blends the act of shopping with the art of experience, it honors the theater’s history as a destination for entertainment and innovation. The restored theater will feature two terraces on the third and fourth floors, few columns 20 ft. ceilings and a glass box overhang. Beyer Blinder Belle was commissioned by SDI toconceive a plan for a viable commercial enterprise that has the support of the City’s Economic Development Corporation (EDC) and 42DP’s Historic Preservation Committee (HPC), which with The New 42nd Street. 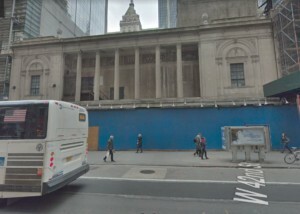 Originally constructed in 1920 by architect Eugene De Rosa, the ornate property will be returned to its original grandeur with many of its classic and hallmark elements in place, such as interior neoclassical motifs, a heavily-decorated proscenium arch and a grand dome decorated in plaster relief. The complex renovation process involves raising the facade by almost five feet, and temporarily removing the historic plaster elements to be restored off-site and then re-installed.